On December 2, 2013, the first ever lawsuit on behalf of captive chimpanzees was filed in the New York Supreme Court. The objective of that lawsuit was to grant Tommy (a chimpanzee) bodily freedom through a common law writ of habeas corpus. Since then, two similar lawsuits have been filed. Leading the charge in all three actions is world-renowned animal rights lawyer Steven M. Wise from the Nonhuman Rights Project. 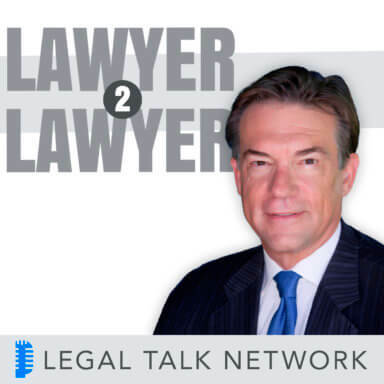 In this episode of Lawyer 2 Lawyer, host J. Craig Williams welcomes back Mr. Wise to discuss the legal theories behind his cases as well as other animals that could potentially benefit. Tune in to hear why Steven is not deterred by the recent loss in Tommy’s appeal and the difference between legal personhood and being human. To hear more from Steven M. Wise on this topic, please listen to “Should a Chimpanzee Have Human Rights?” which was recorded before Tommy’s case was filed. Steven M. Wise is the president of the Nonhuman Rights Project and has been practicing animal protection law nationwide for 30 years. He currently teaches Animal Rights Jurisprudence at Lewis and Clark, University of Miami, and St. Thomas Law Schools and has previously taught Animal Rights Law at the Harvard and John Marshall Law Schools. Wise has published four books on animal rights, including Rattling the Cage – Toward Legal Rights for Animals, and is currently heading three simultaneous lawsuits in the State of New York to free Chimpanzees.